1. Adjust your chair ? The height and angle of your chair should allow your feet to rest flat on the ground with your thighs parallel to the floor. 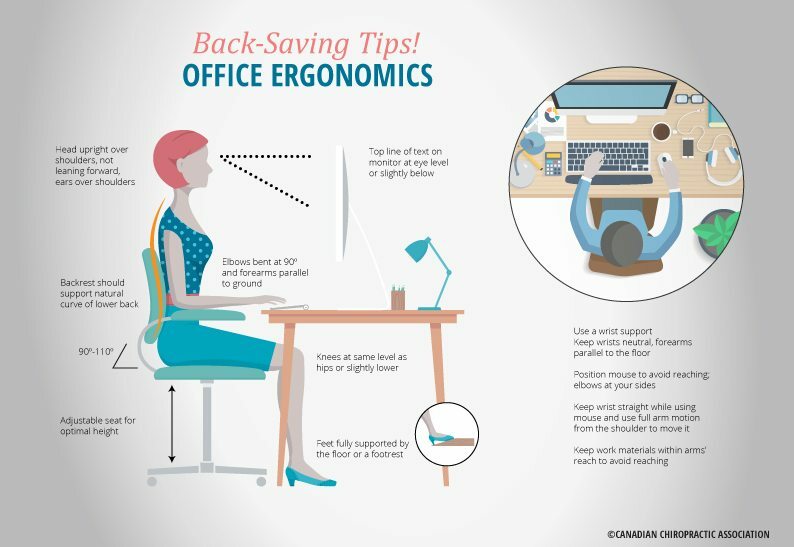 Your shoulders and low back should be resting comfortably against the back rest. Speaking of the back rest, it should be adjusted to an angle of 90-110 degrees to provide adequate support. Your wrists should not bend up or down to reach your keyboard and mouse. Your elbows should bend at 90 degrees and your shoulders should be relaxed. If you struggle to keep your wrists neutral it might be worth investing in a wrist support. Computer screens should be visible without leaning forward or straining. Your screen should be close enough so that you won’t be tempted to lean forward to focus. It should be at eye level or slightly lower. If you are using a lappy grab some books and elevate that screen. Unfortunately as comfy as it is working on the couch your much better off at a table or on the kitchen bench. Knees, hips and elbows should all be bent at 90 degrees. Your shoulders should be relaxed and your feet should rest flat on the floor. If you are vertically challenged like myself you can always use a foot rest which takes the pressure off the back of your thighs. Ideally you shouldn’t be in the one position for more than 30 minutes. Remember how the body was made to move? Well that’s what you should be doing every 30-50 minutes. Treat yourself to a cheeky stretch break or get up off of that thing and go for a wander. Put an alarm or a reminder on your phone every 30-50 minutes to treat yourself to some movement. 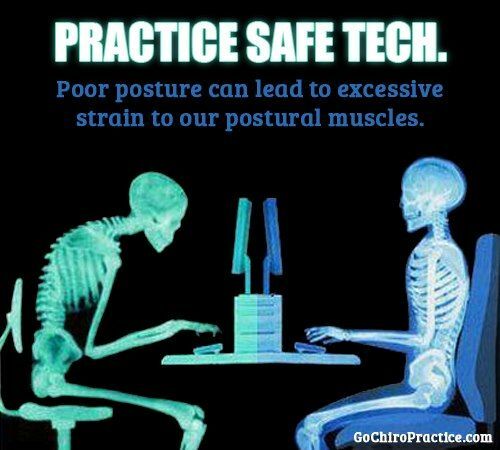 Remember poor posture can really take its toll on your back. If you’d like to discover how you can improve your posture fitness or address your back pain then why not make an appointment at Wholesome Health Chiropractic today. We’d love to help you improve your spinal health.